Bats are one of the most fascinating creatures on Earth! There are over 100,000 species of bat found all over the world. Although there are thousands of species, every single one can be placed under one of two groups; Megachiroptera and Microchiroptera. Continue reading to learn the difference between mega and microbats, in addition to, a couple of interesting facts and characteristics to each. Microbats, or Microchiroptera, are also referred to colloquially by several different names; such as Echolocating bats, small bats, insectivorous bats, and true bats. Echolocation, also referred to as bio sonar, is a sonar-like method used to map a grid out of a bats’ surroundings. Although bats are not blind, like most myths suggestthey require the use of such procedures for finding food and hunting their prey. It operates by emitting little beeps or calls out to the surrounding environment, and listening to the return of echoes bouncing off objects around them. A variety of animals in the animal kingdom use bio sonar; such as dolphins, whales, shrews, and a few cave-bird species. Microbats are modest, some as tiny as 2 grams! They have large ears, but very tiny eyes. They generally eat insects; however, larger species of Microchiroptera actually hunt small prey like frogs, lizards, rodents, and even fish or birds. Vampire bats are a species of Microbat that drink the blood of their prey. Common species of Microchiroptera include the Spotted Bat, Bumblebee Bat, Inland Forest Bat, Leaf-Nosed Bats, Northern Free-Tailed Bat, Horseshoe Bat, and the Spear-Nosed Bat. They can weigh up to 4 pounds and have a wingspan of up to 5 or 6 ft! They have very large eyes, and a much broader wingspan. They are usually found in tropical climates, where the weather is warm and moist. Unlike microbats, the Megachiroptera don’t use bio sonar to locate and hunt for food. Rather , they use their keen eyesight and sense of smell to locate their favorites meals; such as pollen, nectar, plants, and ripened fruit. That’s right; megabats don’t eat insects or small prey like their cousins, the microbats. 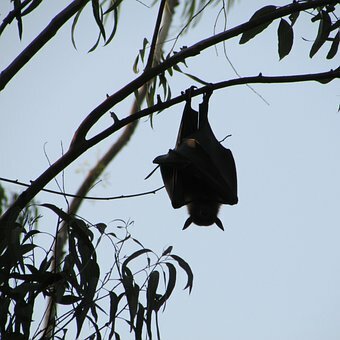 In actuality, megabats are often times known as”fruit bats” or”old world fruit bats”. Their eating habits actually lead to the supply of flower pollens and fruit seeds. This relationship is a form of mutualism called chiropterophily, and clarifies how bats and plants help each other. Common species of Megabat contain all Flying Foxes, Hammerhead Bat, Long-Tongued Nectar Bat, Egyptian Fruit Bat, and Tube-Nosed Bats.